Click the button below to add the Daily Basic Cream to your wish list. May come in Bamboo Cream Jar or Pouch, if pouch you get an extra half Oz more of cream. Formally known as Natural Cream! Our Daily Basic cream is our original moisturizer for your skin including all of our yummy essential oils and liquid crystals to boost the vibration of your skin! Use all over or spot treat for when you need to feel moisturized. Use in the morning for a beautiful all day glow and use at night to keep skin balanced! Customers have reported that they have noticed clearer skin, brighter and more youthful appearance and have noticed a reduction (and in some cases elimination) of rosacea. Aging has everything to do with Vibrations; the lower something vibrates, the faster it deteriorates. Feel the buzz as Crystal Cream raises the vibrations of you and your skin...it was nick named at the famous New Life Expo as the BUZZ CREAM because people were walking around telling others their hands were buzzing from sampling. Apply to Face, neck, and hands or anyplace that needs some extra good energy. Crystal Cream is a yummy blend of actual tiny crystals, minerals, essential oils, flower essences, herbs and VibesUP's famous liquid crystal amplifying formula that can be used for skin care or you may apply to the inside of your hands to bring more of natures miracle vibrations into any ENERGY work you may do. You may also apply to specific areas that could use some vibrational TLC such as a sore throat, knee, stiff shoulders, etc. Left Hand gets Crystal Cream Applied Each Day and Right Hand does not get Crystal Cream. Kaitlyn uses AgeLESS Crystal Cream on her face, neck, chest and ONLY left hand and no cream on the right hand. Look for differences not only in wrinkles, but age spots, veins and even color VIBRANCY. I love to constantly test and do 'hands-on' experiments (yes, pun intended). Sometimes as we have improvements, we forget how things were before. I apply the Crystal Cream every morning and every evening to my face, neck, and chest and then I apply some to the top of my left hand only. Within a couple of weeks I could see a noticeable difference. 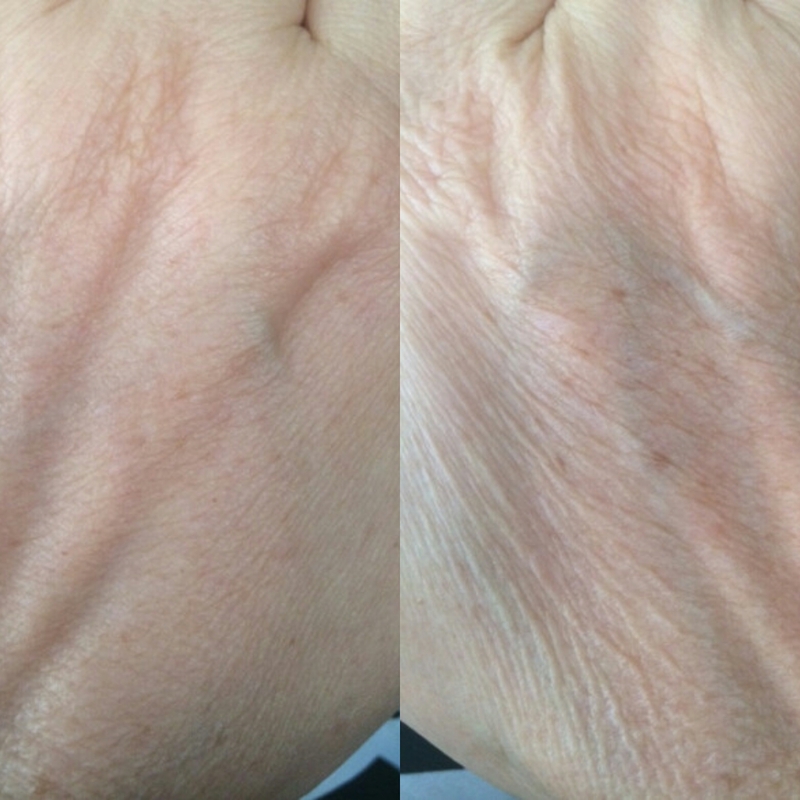 Now it has been several years and it always makes me happy to look at the tops of my hands and say the left hand is the skin on my face now and the right hand is how it would be if I had not used the cream. I am 51 years old and the skin on my face is virtually wrinkle free. AND it's not just about wrinkles but the skin color is better, more vibrant, and there are no age spots on the area of the hand I use the cream on. For a visual of the drastic results possible, we recommend applying it to the face and the back of only one hand; you will be amazed at the difference in even a short amount of time. Kaitlyn, the owner of VibesUP has been doing this and her hands appear to be 15-20 years different in age. *Kaitlyn switches out the creams and uses mostly ageless but occasionally the natural and the blemish.